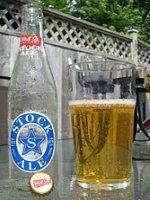 "This thirst quenching "export-style" brew is crafted the way domestic blonde ales were made 100 years ago. The natural sweetness of the malt dominates this smooth ale, making it - what we alternatively call the "Ultimate Hockey Beer" or the "Ultimate Cottage Beer" (depending on the season!)." the Smell: smells like a beer, that beer smell from a night at the bar, reminding you of all the good (and not so good) nights out with the boys. light hops. the Feel: medium, lets you know its there, without being so light it feels like water. Overall: I almost want to add a "sound" this review, it continues to snap crackle pop throughout. I have to admit, its not my favourite, but I can see it being enjoyed by many. Its considered by the brewery to be a "drinking" beer, I would concur, its not too heavy on flavour, or feel, and would be a great alternative to the mass produced options available. I enjoyed mine sans food, in the backyard on a beautiful sunny day. I'd offer light flavoured meats and sandwiches as a compliment.